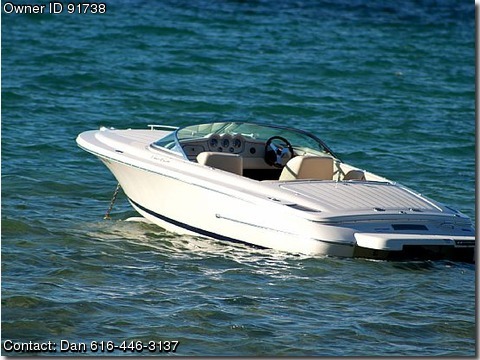 Call Dan 616-446-3137 Basic Description: Beautiful boat - Classic lines and only 69 hours on it. Comes with aluminum trailer, life jackets, throw cushion, fire extinguishers and anything else that is required for coastguard certification. Boat has under floor storage for life vest and also under bow storage for water skis or wake boards. All annual maintenance has been completed - not a scratch on it. Nice Stereo CD player with remote and captain controls. Boat is very fast and handles like a sports car on water. Some teak on bow and wood steering wheel adds for that classic look. Stored indoors and will store for winter months if needed.